I’ve always taken birthdays very seriously. Everybody deserves to be spoiled for a day and this should always involve a big cake! 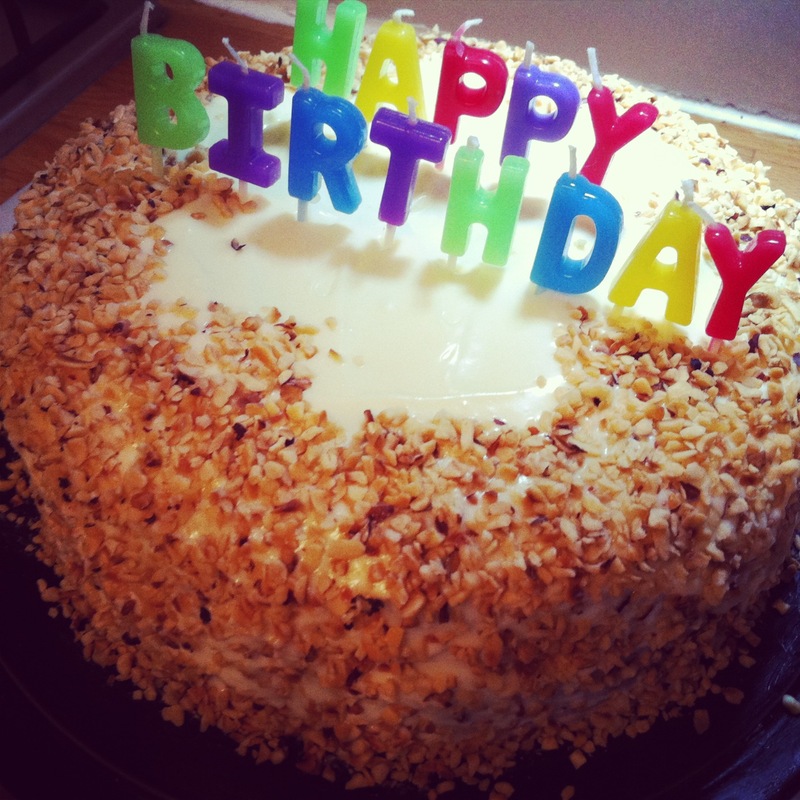 It was Jack’s birthday at the weekend so I decided to bake his favourite – carrot cake. This recipe is wonderfully simple, although it does take a bit of time…but trust me, it’s totally worth it! It doesn’t take very long to make the cake itself, but you’ll need to wait until the cake is cool until you ice it. This is really important, otherwise the icing will melt and you’ll be left with a sloppy mess! (I speak from experience…although it does taste just as good this way, so if you’re hungry and don’t care about points for presentation, don’t worry too much…). You’ll also get the best results if you ice the cake in stages and refrigerate it to allow it to set. I’ve tried different recipes but this one’s my all-time favourite. The fruit in the sponge keeps it really moist and the cream cheese frosting is seriously yummy. Pre-heat the oven to 160 degrees / Gas 4. Grease a 23cm springform tin and line with greaseproof paper. 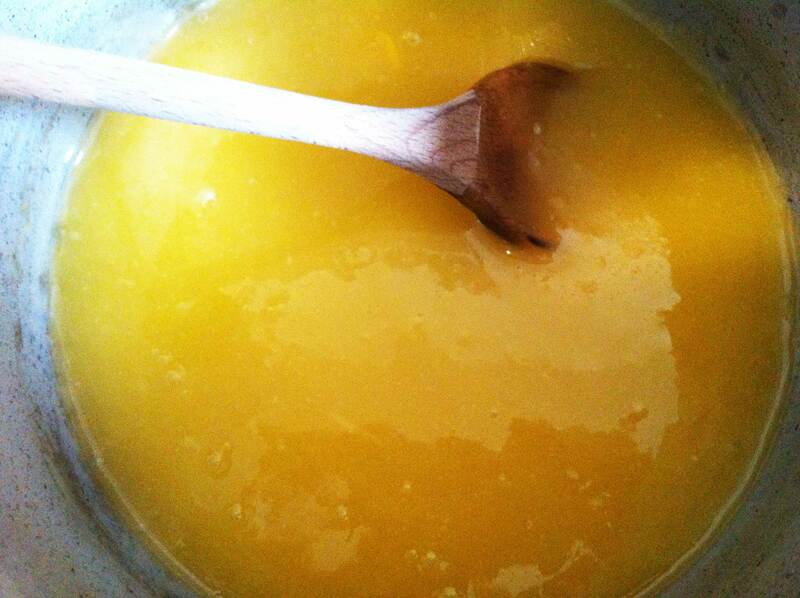 In a large bowl mix together the vegetable oil and sugar. Add the eggs separately and whisk together each time. 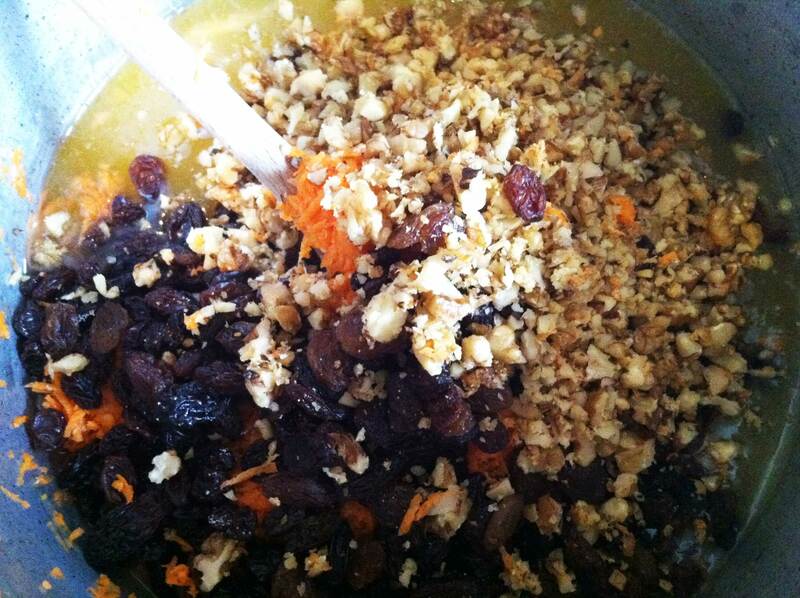 Add the grated carrot, fruit, walnuts and coconut and mix. Sieve the flour, baking powder, cinnamon and nutmeg into the mixture and mix thoroughly. 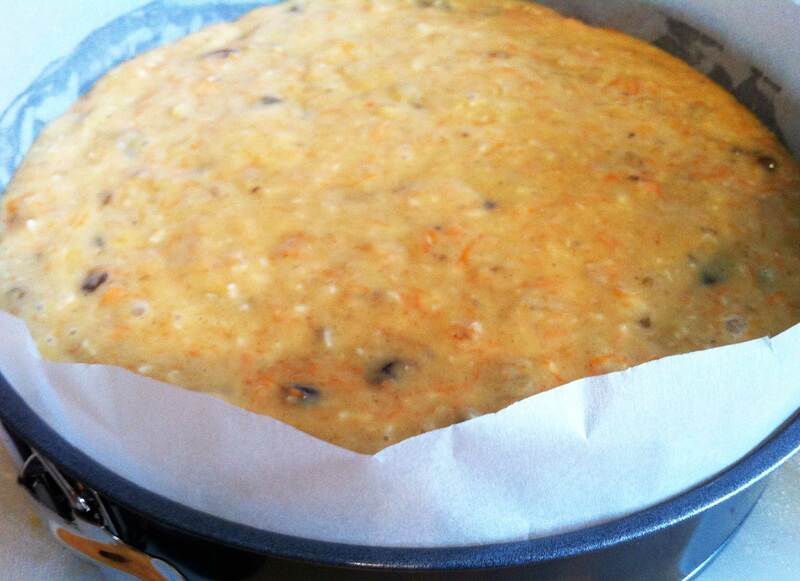 Add the milk until the batter is a pouring consistency and pour into your cake tin. Place on the middle shelf of your oven and bake for 1 hour and 40 minutes, or until a skewer is inserted at the centre of the cake and comes out clean. Leave the cake to cool in the tin for 15-20 minutes then transfer to a wire rack and leave until cool (usually takes around 2-3 hours). Sieve a third of your icing sugar into a bowl and add the softened butter (make sure the butter is really soft or you’ll have lumps!). Mix together and then add the cream cheese and vanilla essence. Continue to mix in the rest of the icing sugar in stages until fairly stiff. Refrigerate for 30 minutes. Meanwhile, using a knife with a perforated edge (e.g. a bread knife), carefully cut across the middle of the cake to create two layers. If your cake is domed, use the same technique to cut off the top half inch of the cake so that it’s level. With a butter knife, then spread a thick layer of icing on top of the bottom layer. Add the top layer to the cake and using your knife to smooth any icing that spills out. Then, spoon a large dollop of icing onto the top of the cake and spread across the top and sides. This is your crumb layer. Refrigerate for 10 minutes. Spoon another large dollop of icing onto the top of the cake and repeat the process. Refrigerate again. Decorate your cake with the chopped nuts. This cake looks perfect, great job! Happy 60th birthday @richard.s.v.bray 🎂 Back in the day when we coordinated our knitwear.